I thought it was a joke. I think we all did. Last year, before E3, EA was rolling out silly adverts with contemporary shooter plant puns. Petal of Honor. Grass Effect. Dead Face. Like I said, I thought EA and PopCap were making a little joke out of leaks and E3 marketing. Then their presentation happened, and I was positively blown away by the presence of Plants vs. Zombies: Garden Warfare. 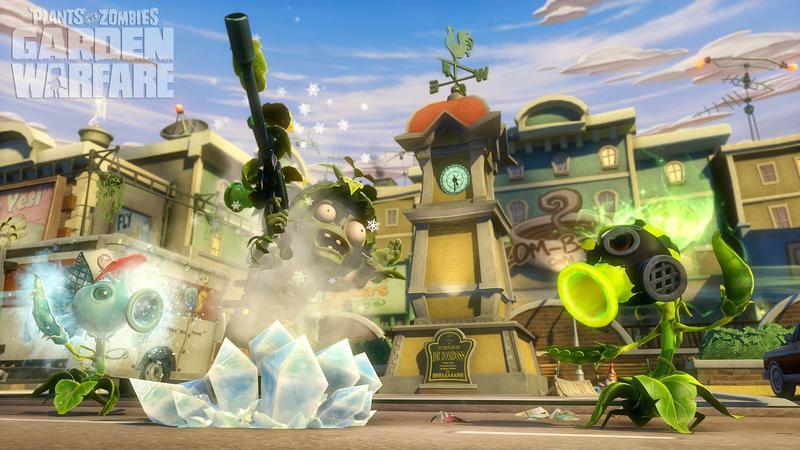 PopCap was using the Frostbite 3 engine to turn the Plants vs. Zombies world into a third-person, class-based shooter with an emphasis on slapstick gameplay. Sounded like my kind of game, and it suddenly jumped to the top of my can't-wait-to-try list. But, was this new adventure all flair and no substance? Was PopCap taking a bad series of puns a little too far? Garden Warfare is out now on the Xbox One and Xbox 360, and I can tell you they were dead serious. 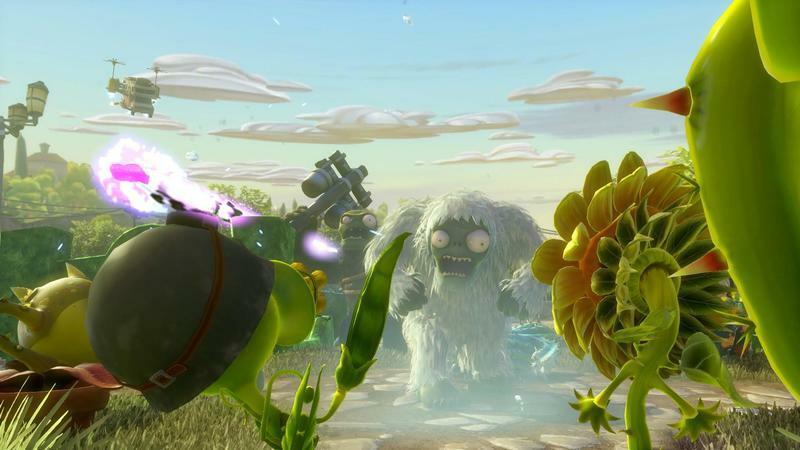 Plants vs. Zombies: Garden Warfare is a whole lot of fun. What immediately turned me on the Garden Warfare, both during its preview period and once I had the retail copy in my hands, was the look and sound. 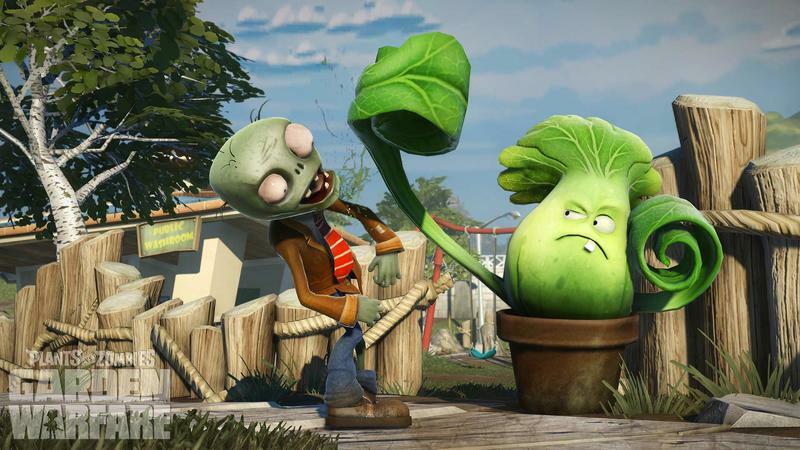 Next to the world of realistic shooters on consoles, Plants vs. Zombies: Garden Warfare is the beacon of oddity that I've been hoping for. The original title is cartoony on all platforms. The tower defense effort that spawned this zombie and botanical wonder has a very simple and bright look. 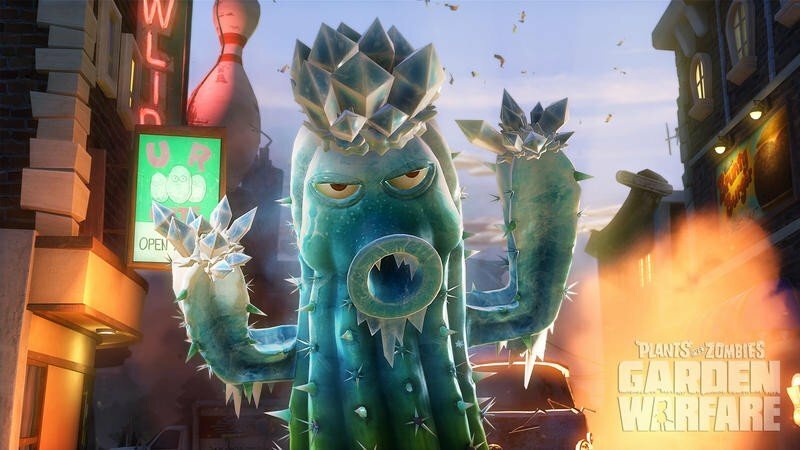 PopCap successfully turned that cartoon touch into a full 3D effort using the Frostbite 3 engine. Rather than going dark and gritty, something I don't think they would have ever dared do, PopCap managed to develop a wonderfully vibrant world with Garden Warfare. Every map, even the ones that feature the cover of night, is bright and colorful. If unicorns had dreams, they'd probably share similar color palettes with this game. Now, I've been covering games professionally for a long time. For certain sects of mainstream gamers, colorful qualities make some games a little too "kiddy" for their liking. Those gamers would rather see a shooter covered in blood, brown and gray than one that's imbued with all the wonder and personality of the Plants vs. Zombies universe. Those people, then, might hate this game based solely on its looks. Their loss. The vibrant colors, hilarious character designs, lush environments and unique maps all come together to make Plants vs. Zombies: Garden Warfare one of the most visually pleasing shooters I've ever played. It might not be the hyper-realistic effort some gamers want on the new generation of consoles, but it is pretty. That extends to the soundtrack, too. As you're capturing or defending points in some game modes, you'll probably be humming along with the game's tunes. 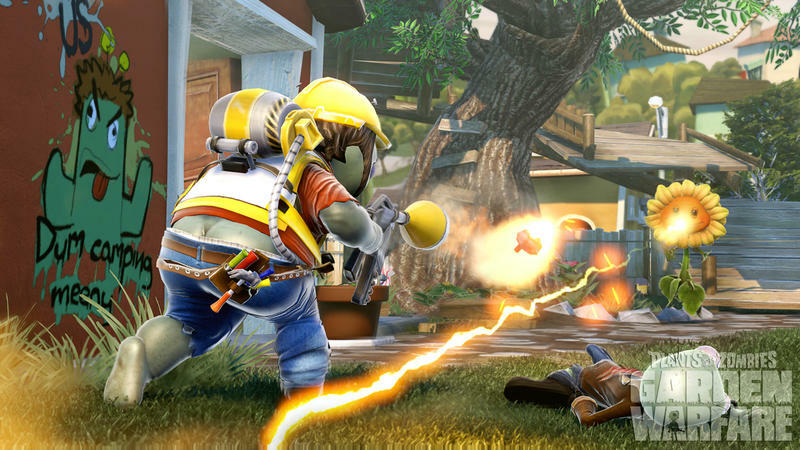 Is Garden Warfare nothing more than hilarious window dressing? Fortunately for fans of class-based shooters, it's not. There's actually a fun shooter below all this nonsense. 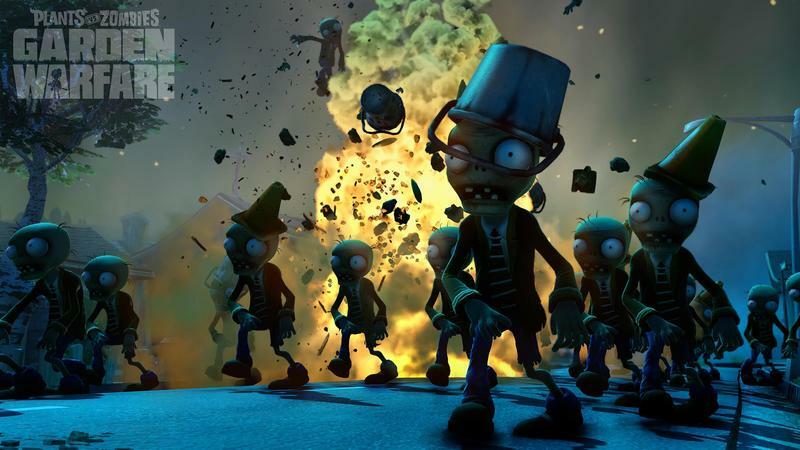 PopCap successfully blended previously established multiplayer game modes into a single odd package. We've got a ticket-based team deathmatch offering in Vanquish, a unique take on Battlefield's map conquering conquest mode in Gardens and Graveyards and a 10 wave horde mode in Garden Ops. 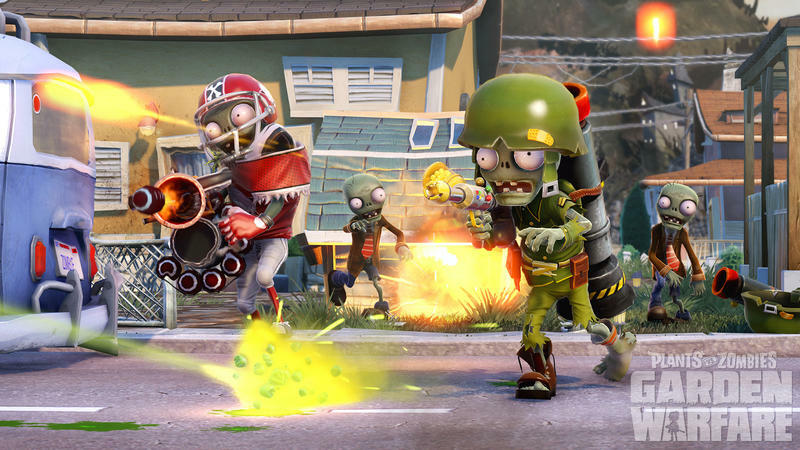 Each team of plants and zombies has four basic classes to pick from. The interesting part, though, is that each class plays differently from its zombie or plant counterpart. The peashooter and foot soldier, for instance, match together well, but they require unique playstyles to be best used. The foot soldier has a rocket jump and rocket launcher. He also offers a grenade. He shoots fast and can deal quick damage to every character. The peashooter, though, has a single shoot standard weapon. He has no grenade but does offer a sprint mode that makes for fast movement and high jumps. He can enter gatling gun mode if planted, too. Just because you're good with the infantry style unit on, say, the zombie team, doesn't mean that you'll be good with the peashooter. That's interesting to me. And it makes mastering this game that much harder and more rewarding. You can spread that disparity to all characters, too. The plants have a traditional healer with the sunflower, while the zombies scientist can heal with a deployable while being great at close range combat. The only melee character is the chomper, though he can be quickly nixed with the zombie engineer. The checks and balances here are not nearly as point-blank obvious as they are in games like Team Fortress. There's a great counter for just about every ability, but it takes some learning. I will also mention that, at least at the beginning of my personal experience with the game near launch, I did have some trouble getting into stable matches. Some game types were inaccessible altogether, while other matches were filled with persistent lag. That has, as of Monday, slowed down significantly. Things are much better now than at launch, something I find myself regularly thinking in this age of online gaming. One of my biggest compliments for Garden Warfare is, oddly enough, one of my largest complaints. This stems from the character progression in the game. Let's start with the compliment side of the coin. Every character can be customized with earned abilities, costumes, weapons and alternate styles. These bits and bobs are all purchased in the sticker shop. You'll earn coins from playing games. Depending on your skill, you'll likely earn somewhere between 1,000 and 2,000 coins per match. Now, you'll take those coins to the sticker shop in between matches or from the main screen. In the shop, you'll be able to buy sticker packs in set increments. The higher the cost of the pack, the bigger chance for better stickers. There are no microtransactions in Garden Warfare right now. That could change if the community wants it, but the only way to currently earn coins is to play the game. This, to me, is a huge plus for the game. I love PopCap and EA's decision to go this route, and I applaud them for it. The problem? Character progression is incredibly random thanks to the sticker packs. You'll level up your account, and you'll level up each character. However, levels only bring more coins and more sticker packs. The sticker packs have random contents. You might get lucky and win abilities or weapons. Or, hey, you might just win some consumables and weapons for characters you aren't actively trying to level up. If you play a crap ton of the game, this really isn't a problem. Progression will happen slowly and more randomly than you like, but you'll still get your in-game goods. For players who approach the title more casually, the fact that progression is randomized is sort of annoying. 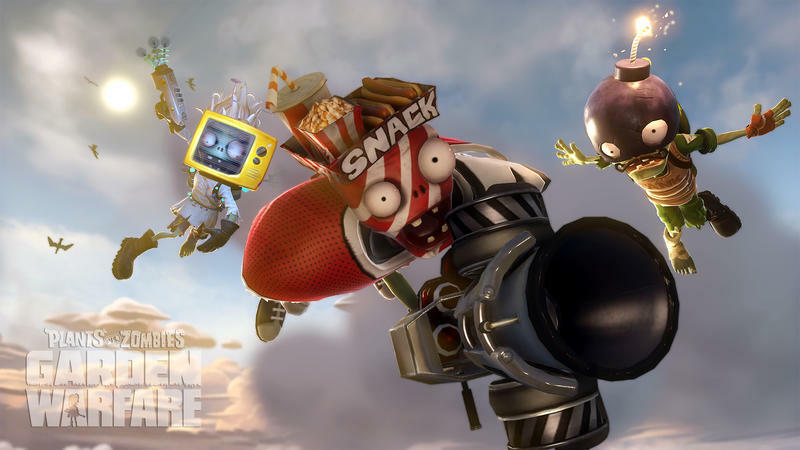 Garden Warfare is fun, and the time I've spent with it so far has been among the best on the Xbox One. 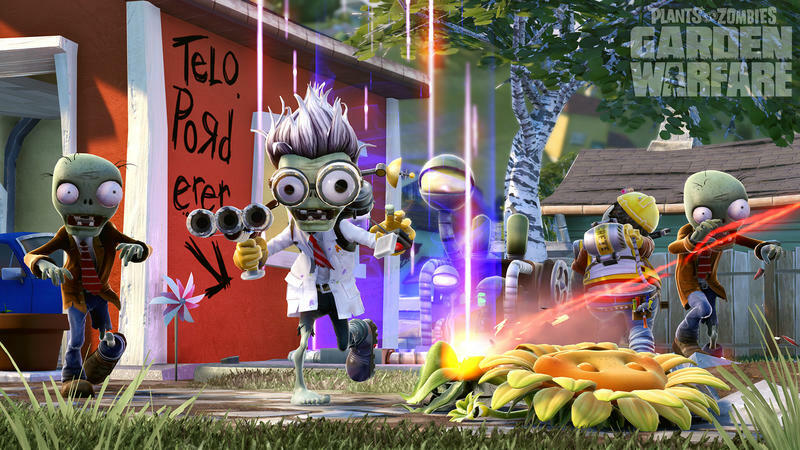 EA and PopCap have produced a really great alternative shooter in Plants vs. Zombies: Garden Warfare. The aural and visual aesthetics rock, the gameplay is balanced and unique and the absence of microtransactions is a blessing in today's age of gaming. However, the randomized character progression is problematic. Add to that the fact that we only have three modes of play currently, and the overall package can wear quite thin at around the dozen hour mark. The narrow amount of content sort of goes against the $40 price tag on the Xbox One, too. I could see paying $20 with no complaints at all, but this price point is a little too high for my liking. In spite of that, this is a bonafide shooter. 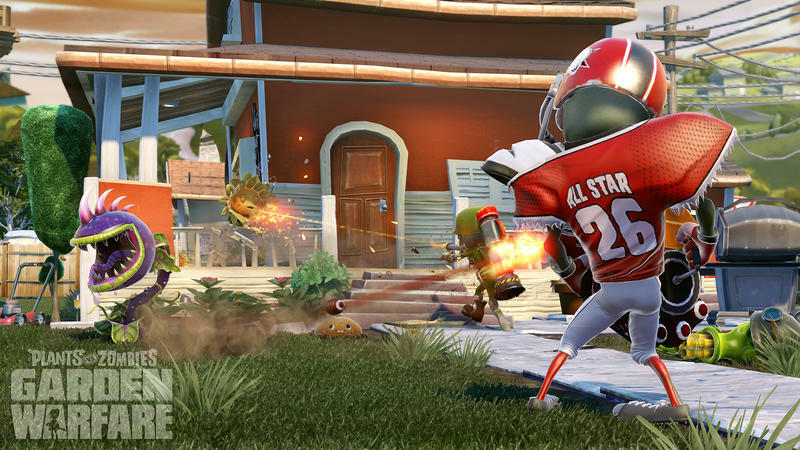 Garden Warfare is fun, and the time I've spent with it so far has been among the best on the Xbox One. If progression is helped through microtransaction-less patches and a few more modes of play and playlists are added to the mix, this shooter can enter the realm of greatness. 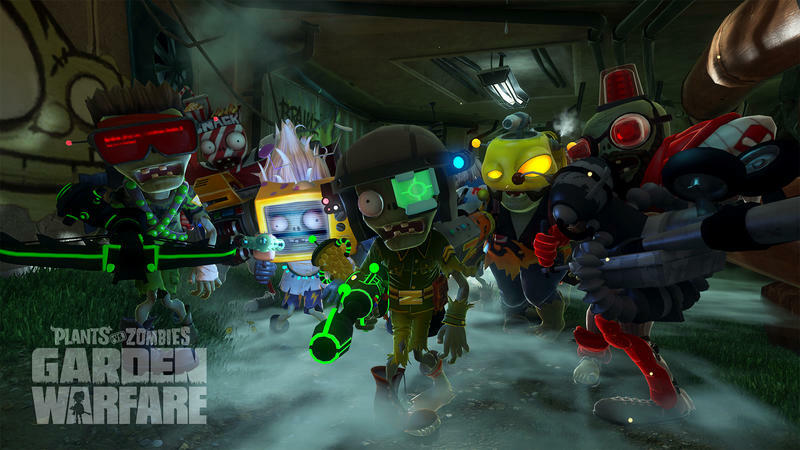 We received a copy of Plants vs. Zombies: Garden Warfare from EA and purchased our own on the Xbox One on launch day. We played all the games modes and used all characters for at least 10 hours before starting this review.